The Alpine Lodge is within minutes of all the best Northern Michigan has to offer: sprawling forests teeming with wildlife, challenging slopes for the avid skier, and a multitude of clear lakes and streams for swimming, boating or fishing. The 24 beautifully sculpted courses in the area invite both beginning and seasoned golfers to their fairways, and the staff at the Alpine Lodge is poised to create a personalized golf package with your budget and style in mind. 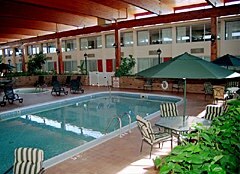 Hotel amenities include an atrium with swimming pool, sauna and whirlpool, full-service restaurant and lounge, game areas and lounge areas, and a smiling staff standing ready to welcome you with hometown hospitality.